Gloves made of Nylon. Detailed pleats on the back of the hand. One snap at the wrist. Perfect for weddings, proms, or just about any formal affair. LENGTH, TIGHT or LOOSE depends on your arm circumference. 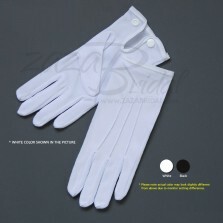 ..
White 100% Cotton Boy's Gloves with Snap Closure. 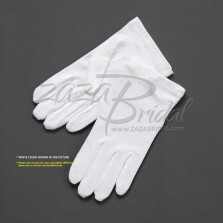 Gloves made of 100% cotton. Solid white. Detailed pleats on the back of the hand. One snap at the wrist. LENGTH, TIGHT or LOOSE depends on your boy's arm circumference. 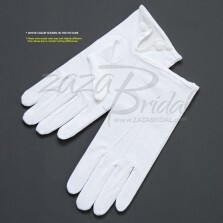 ..
Gloves made of 100% cotton. Solid white. LENGTH, TIGHT or LOOSE depends on your girl's arm circumference. 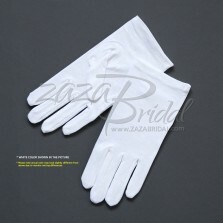 ..
White 100% Cotton Men's Gloves with Snap Closure. Gloves made of 100% cotton. Solid white. Detailed pleats on the back of the hand. One snap at the wrist. LENGTH, TIGHT or LOOSE depends on your arm circumference. 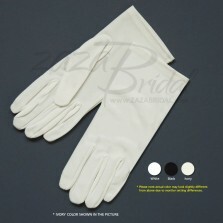 ..
Gloves made of 100% cotton. Solid white. LENGTH, TIGHT or LOOSE depends on your arm circumference. ..
Gloves made of Nylon. Perfect for weddings, proms, or just about any formal affair. LENGTH, TIGHT or LOOSE depends on your girl's arm circumference. ..
Gloves made of Nylon. Perfect for weddings, proms, or just about any formal affair. Lavender and Lilac Color - Only Large size LENGTH, TIGHT or LOOSE depends on your arm circumference. ..